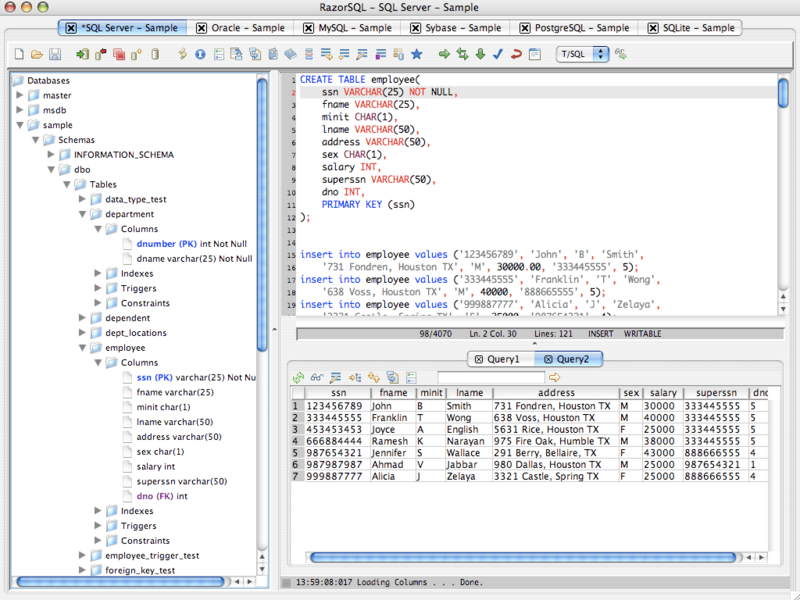 RazorSQL is a SQL database query tool, SQL editor, database browser, and administration tool with support for all major databases and built in connection capabilities for DB2, Derby, Firebird, FrontBase, HSQLDB, Informix, Microsoft SQL Server, MySQL, OpenBase, Oracle, PostgreSQL, SQL Anywhere, SQLite, and Sybase. Any other JDBC or ODBC (Windows only) compliant database is also supported. RazorSQL ships with a built in relational database engine that is up and running out of the box and requires no end user administration. Some of the main features contained in RazorSQL are visual tools for creating, editing, describing, altering, dropping, and viewing database objects; tools for importing and exporting data; a database browser for the viewing of database objects and structures; and a robust programming editor with support for SQL, PL/SQL, TransactSQL, SQL PL, PHP, Java, XML, HTML, and twelve other programming languages. Also included are a query builder, tools for creating, editing, and executing stored procedures, triggers, and functions, a tool to compare table data and/or query results, and SQL history. Add functionality with the plugin API.